Do you know how to use semicolons, where to put your apostrophes and when to use commas? Do you know the difference between affect and effect, if and whether, or who and whom? Do you know why this stuff matters? If you've reached a stage in your career or education where your writing needs to be high quality, Grammar for Grown-ups is a must for your top drawer. Vocational rather than academic, Grammar for Grown-ups is packed with real-life examples and keeps you engaged with a wealth of great quotations from Homer the Greek to Homer the Simpson. Straight talking and methodical, Craig Shrives draws on his years as an intelligence officer as well as over a decade spent compiling his popular grammar website to present a comprehensive but light-hearted and easily digestible grammar reference guide. Craig Shrives and Paul Easter are officers serving with the Intelligence Corps. Craig is the author of the bestselling Grammar Rules and (with Paul) Balance-Today.org, a reference site that analyses popular and topical stories featuring bias and fallacious reasoning to highlight the consequences of poor critical thinking and prejudiced messaging. First off: I've purchased at least six other same-type of grammar books here on Amazon in the past few years and this is the BEST I've found. I have absolutely no complaints about how this book is written, or the information it gives to those seeking to better themselves in their writing. My one issue however, is the very small print that this book is using. Had I been aware of it I would have thought twice before purchasing. You see; I have poor eyesight (millions of people do). I wear glasses but still the type is so small that I have to use a magnifying glass for reading this book. It's a clumsy way to read a book, at best. My first choice for this book would have been in electronic form so I could control the font-size on my Kindle. This is why I mainly purchase electronic books. I'll keep my eyes peeled for this book coming out in electronic form (epub, mobi, pdf...etc.). The book itself is beautiful but my eyes cannot peruse it with ease. It's a strain to view for longer than a few minutes at a time. I won't take away stars for the small print because the book itself, is fantastic in content. 5.0 out of 5 stars"Grammar Rules," not "General Rules"
Somehow, Amazon got the wrong word in its database. No matter, the book is wonderful. It's really chock full of rules, and examples to illustrate the rules, for such categories as Punctuation, Parts of Speech (all 8 parts of speech are represented), Easily Confused Words, and a Miscellaneous category that includes Numbers, Plurals, Abbreviations, and other matters. The author takes care to let you know when correct grammar admits several possibilities -- like introducing a quotation with a comma, a colon, or no punctuation -- and points out a simple rule for those of us who want a simple rule in those cases. (In this case, he says: "Quotation six words or shorter? Stick a comma in. Longer? Stick a colon in. Job done.") All in all, a very enjoyable AND educational book. excellent example sentences to clarify what he previously discussed. This book is the epitome of what a reference book should look like. A must have for your library. I also follow this author through weekly emails which are fantastic & on Twitter. He provides great refreshing grammar rules. He also provides the reading with great tips and memory joggers. Kudos! I've been searching for a comprehensive grammar text for over ten years. 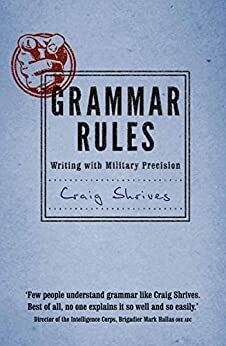 The book, Grammar Rules … Writing with Military Precision" is well written, easy to understand, and exceeds my expectations. The author, Craig Shrives, sense of humor and examples, prevent the manual from being a boring list of rules. Following the rules in this manual will do much to help make your writing outstanding. 5.0 out of 5 starsEvery writer should have this book. This book is very user friendly. Even seasoned writers (of which I am not) should have a copy of this book in their library for easy reference. It is very informative and extremely helpful.